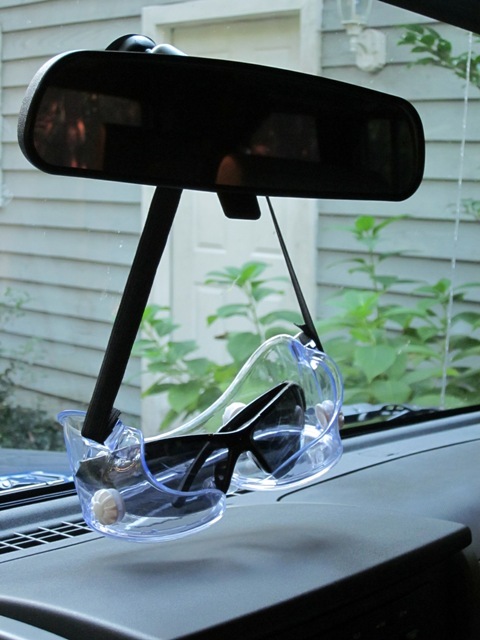 Anyone have any unusual accessories on or within their car? I’ve hung a pair of laboratory goggles from my rear view mirror for the past 20+ years. It started off as a gag with a friend, but since has grown to become part of my vehicle’s personality. They make a perfect holder for sunglasses and it proudly displays my geekiness. So… anyone else willing to share their vehicular weirdness? Okay. I’ll bite. It’s not really weird or unusual but I still categorize it geeky. Tech geeky. When I was a kid, my mom had a “Warp Drive” button on the dashboard of her 1991 Volvo Station Wagon. And one day heading home from school, I hit the button, she mashed down the gas petal, and I swear I started to see the stars blur.